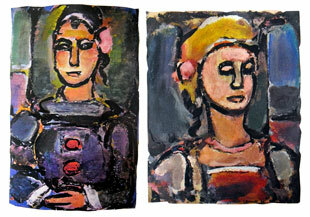 Here are 1 print by Georges Rouault that is presently for sale. Click on the image to enlarge it. Georges Rouault was born in a cellar in 1871 (during the Paris Commune), and these dramatic circumstances probably forever affected his view of the world “I think the massacres, the flames, the terror that surrounded my birth imprinted upon my mind and eyes their fiery and fleeting substance, “he wrote to Suarès in 1913. 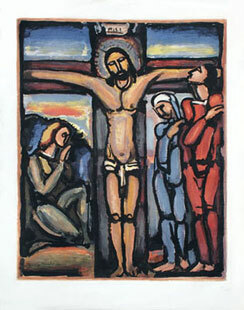 Aged 14, Rouault was apprentice in a stained-glass workshop ; shortly afterwards, the adolescent boy entered a state of moral crisis, during which his conversion occurred. Aged 20, he enrolled at the Paris Beaux-Art and became a pupil of Gustave Moreau. When the latter died in 1898, Rouault once more underwent a period of crisis and solitude ; it was then he met Catholic writers such as Huysmans and Léon Bloy. In Paris in the 1910s, Rouault painted Christ’s death and passion as well as whores, circus acrobats and clowns ; his look on human decadence is at time benevolent, at time censorious, as he portrays beings void of all spiritual content. Christ ‘s face became one of his favourite themes, but he was understood neither by the general public –Rouault was accused of being a fraud-nor by the critics. The important critic Camille Mauclair wrote : “Beneath the show of epilepsy, we can feel affectation”. Rouault took time to overcome this ruthless judgment. As the artist got older, his paintings somewhat brightened, as did his view of mankind. In his lifetime Rouault painted some 800 pictures, and after the second world war he undertook to list all his work. These paintings were all held by Vollard, with whom Rouault had signed an exclusive contract ; but Rouault, on the grounds that some were below standard, started a ten-year lawsuit to get them back –upon which he burnt 300 of them. All his life, Rouault showed great interest in engraving and lithography, and he produced numerous prints, above all some important colour-aquatints. He also illustrated some books, which are now extremely hard to come by and highly sought-after : Baudelaire’s “Les Fleurs du Mal” with 14 etchings ; “Les Réincarnations du Père Ubu”, with 22 etchings and 104 woodcuts, and his two masterpieces : “Passion” by Suarès with 17 etchings and colour aquatints, and “Miserere” with 58 etchings. Rouault died in 1958. 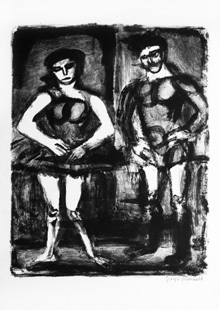 - Georges Rouault, l’oeuvre gravé in two volumes, referenced all the prints of the artist (lithographs and etchings). This catalogue had been established by François Chapon and Isabelle Rouault (the daughter of the painter). André Sauret Publisher, Monte Carlo. 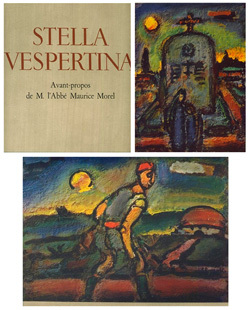 - Rouault, le livre des livres, here reproduced, list all the illustrated books of the artist. Catalogue also made by François Chapon. André Sauret publisher, Monte Carlo 1992.